This July 6 edition (after the first half) profiles Bill Dillof, who died recently and unexpectedly, on this Across the Blue Ridge episode. An attorney who left his career and devoted much of his energy to old-time and traditional music as a performer and scholar, Dillof demonstrated unquenchable enthusiasm for the oldest recordings — and new interpretations. You will hear some of his playing towards the end of this episode. 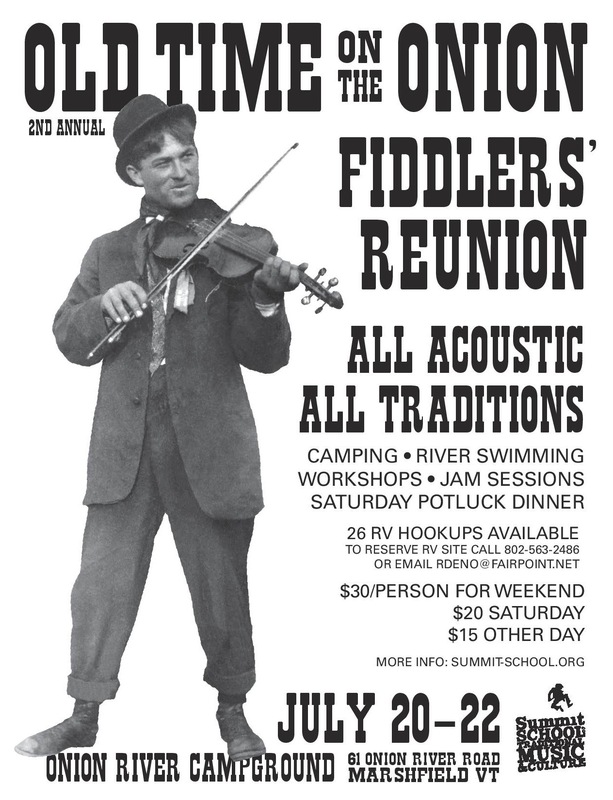 Old Time on the Onion Fiddler’s Gathering is coming July 20 – 22 to the Onion River Campground! 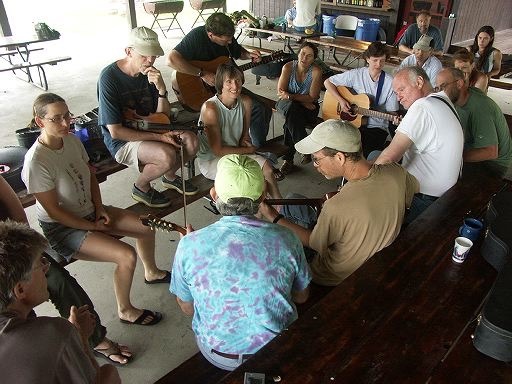 Three days of camping, jamming, playing, relaxing, workshops, sharing food and good company by the idyllic Winooski River! Workshops to be presented by..
As with so many aspects of Frank’s life, his way might be considered a bit out of the box. Highly musical, but just a little different. Frank has been a musician and a composer for most of his 89 years—wildly creative and possessed with an encyclopedic memory. Frank not only remembers innumerable gigs and recordings going back well before 1940, but he can also name many of the musicians who played the gigs and even specific tunes and keys. “Remember that Bob Wills session back in 1946 where Louis Tierney played a hot chorus on ‘Sweet Sue’ in the key of G?” I just made that last one up, but these reminiscences are typical of what goes through Frank’s mind every waking hour. Naturally we mortals are lucky to even remember the recording, much less the specific tunes and keys. Frank could probably even sing or play the hot choruses. Multiply this by thousands of reminiscences, and you’ll begin to get the hang of his conversations. 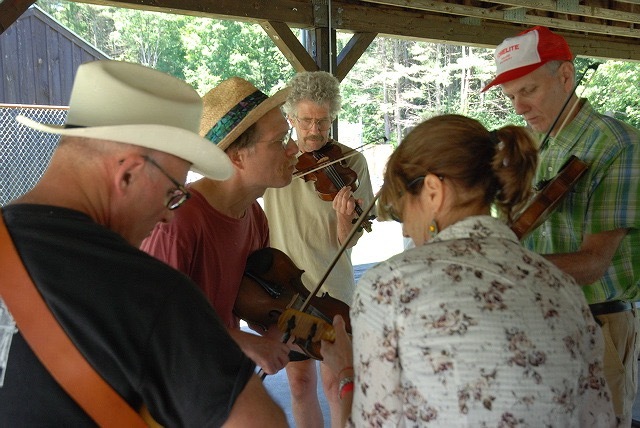 As accomplished a fiddler as Frank is, I was surprised to discover that he somehow also found time to learn to play alto and tenor saxophone, clarinet, guitar, bass, and mandolin. He even learned to tap dance at an early age, and tapped for exercise into his 70s. Frank truly has no idea of how many original fiddle tunes he has composed. We know that he composed at least 159, one for each Georgia county. Regular Fiddler Magazine readers might remember a review of his book of tunes and CD set a few years back. Astonishing as it may seem, these compositions are just the tip of the iceberg. 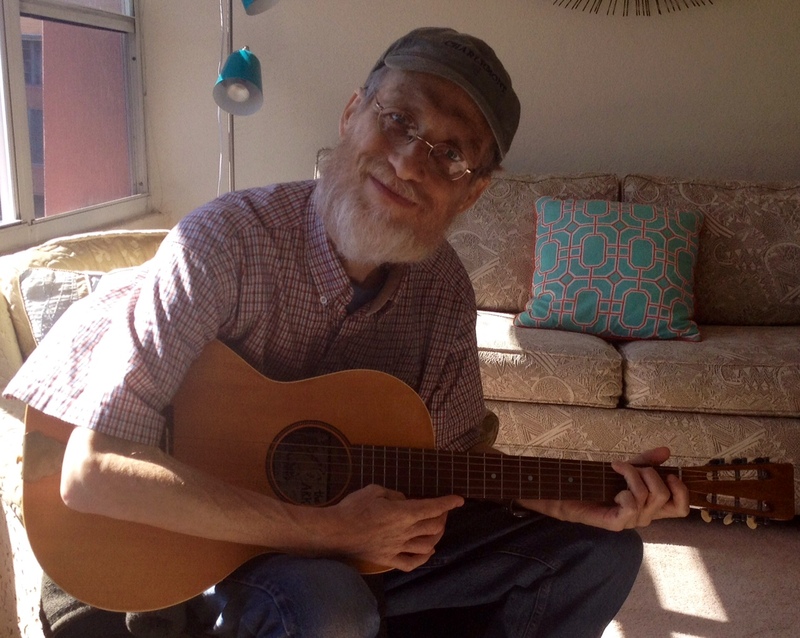 His friend and fellow musician, Tom Mindte, estimates that he has written at least 1,000. Frank’s tune titles are, to say the least, a bit idiosyncratic. “Ethelyn’s Dancing Arpeggio Waltz,” “Chuck Nation Flowery Branch Reel,” and “Billy Puckett Old Time Key of G Breakdown” are just a few examples. 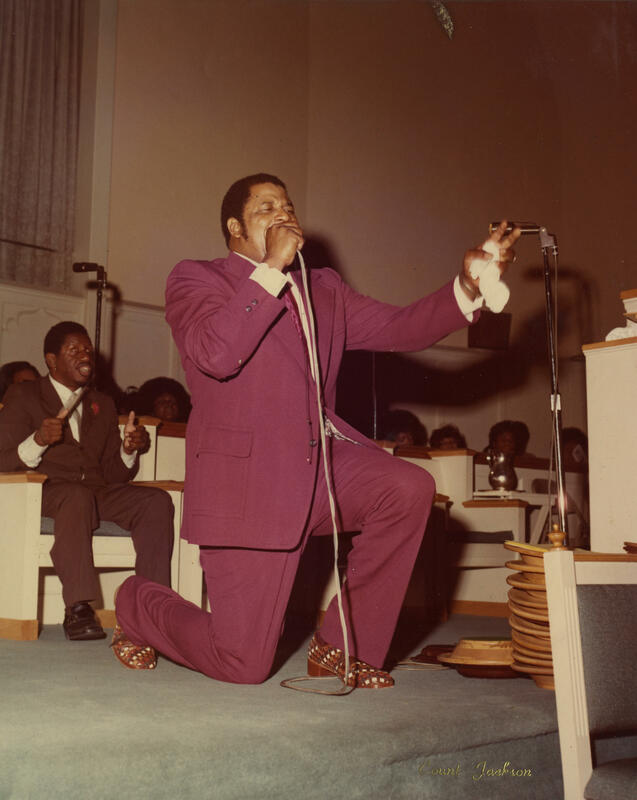 Considering that the 159 Georgia county tunes were composed in the span of just a few months, it’s anybody’s guess how many he’s composed in the rest of his 89 years. Fortunately for all of us, Frank shows no sign of slowing down his compositional output. A typical Frank Maloy day might begin with him noodling on the mandolin until a tune comes to him. He’ll then transcribe it and name it after a place or person. Frank was born in Milan, Georgia, on January 2, 1927, into a family in which nearly everyone played string instruments. 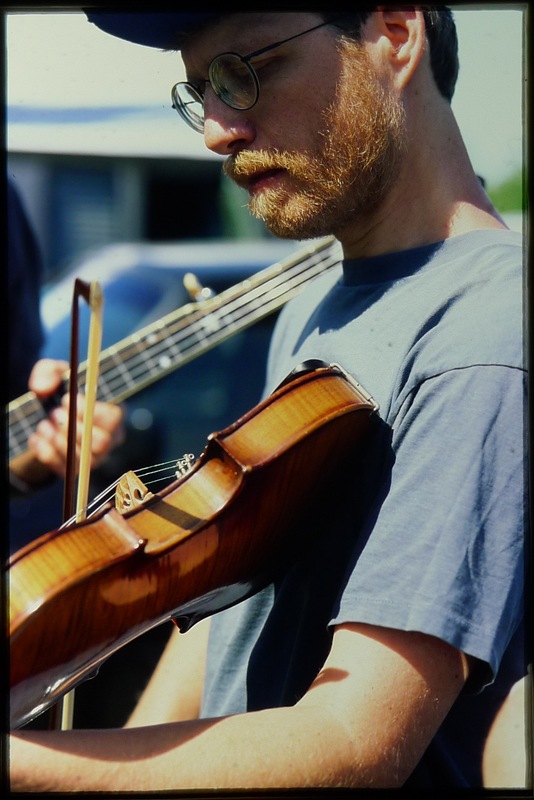 As a youngster he started off playing fiddle with a bow his mother haired with sewing thread. Frank studied the violin with several teachers and also completed the U.S. School of Music correspondence course, giving him a good background in music theory. 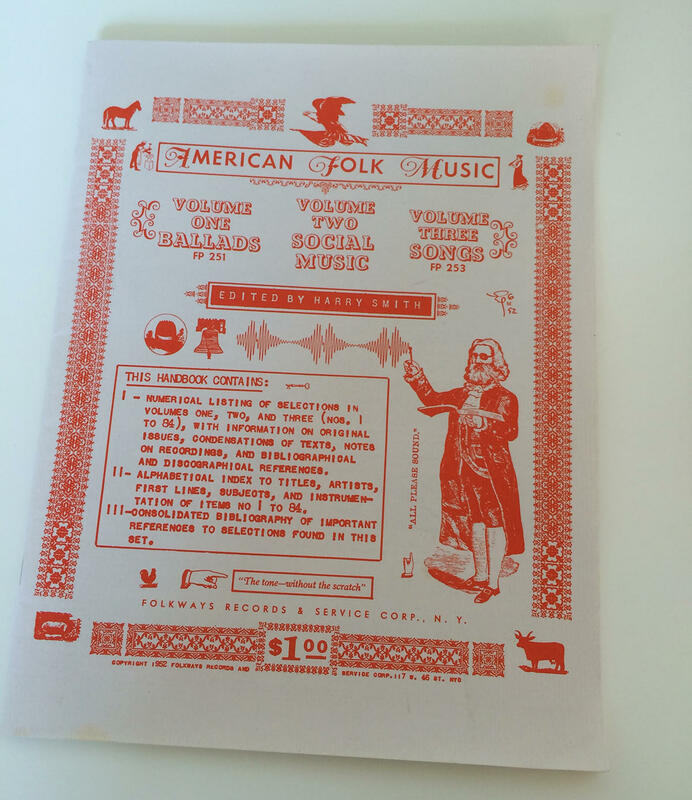 Fascinated by old time fiddle tunes, he ordered 1000 Fiddle Tunes, published by M.M. Cole, from the Sears, Roebuck catalog, and began playing the tunes. Frank had two brothers, Grooms and Joe, both of whom were musicians. Brother Grooms, who played mandolin, guitar, and fiddle, was tragically killed in action in the Philippines in World War II. Frank and Brother Joe, however, continued to perform, and by 1946, the then-teenaged boys were playing on radio station WBHB in Fitzgerald, Georgia, with Charlie Dowdy and the Prairie Boys. By 1950 Frank began a 10-year stint playing on radio and TV with Uncle Ned and the Hayloft Jamboree at WMAZ in Macon. 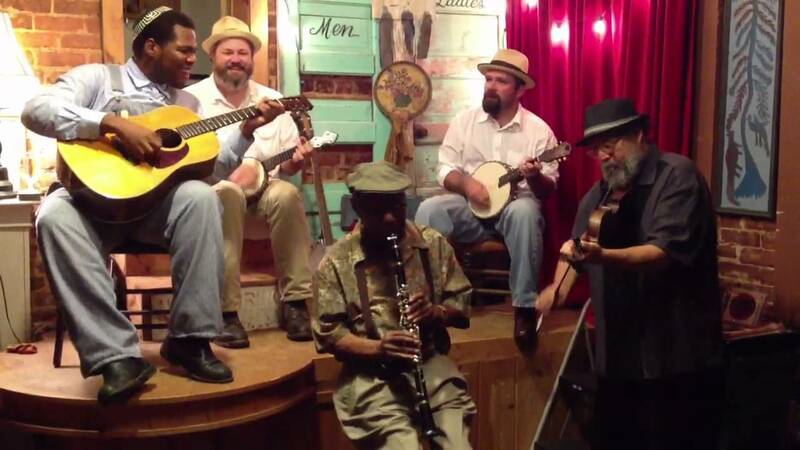 Later, Frank and Joe reunited in Macon to perform in their own group, The Swingmasters. During the 1980s, Frank and Brother Joe played beach music—also known as shag music—and 1950s rock and roll in the Outer Banks of North Carolina. Returning to south Georgia, they performed with the Dave Mercer Band for over a decade. Brother Joe, who played bass, guitar, mandolin, and fiddle, passed away in 2005. 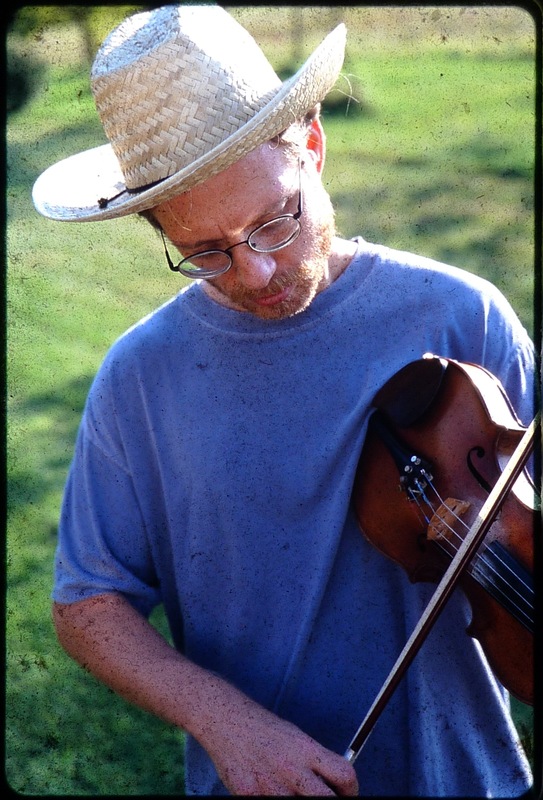 We are fortunate that Tom Mindte’s Patuxent Music was able to record a terrific CD in 1999 featuring Frank’s fiddling and Brother Joe’s guitar work. Entitled Time Will Tell, the disc, CD065, is still available on the Patuxent website (http://pxrec.com). Remarkably, the Maloy brothers had never commercially recorded until the release of this CD. On it, the brothers play swing-era standards—good, sophisticated tunes including “Poinciana,” “Embraceable You,” and “Charmaine,” with only one Frank Maloy original. Frank’s name might ring a bell with Fiddler readers, as for over 30 years he was a contributing writer and tune transcriber for the fine old publication The Devil’s Box. When Frank begins reminiscing, chances are he’ll not only mention playing a dance back in 1946, but some of the numbers he played on that date and their keys as well. 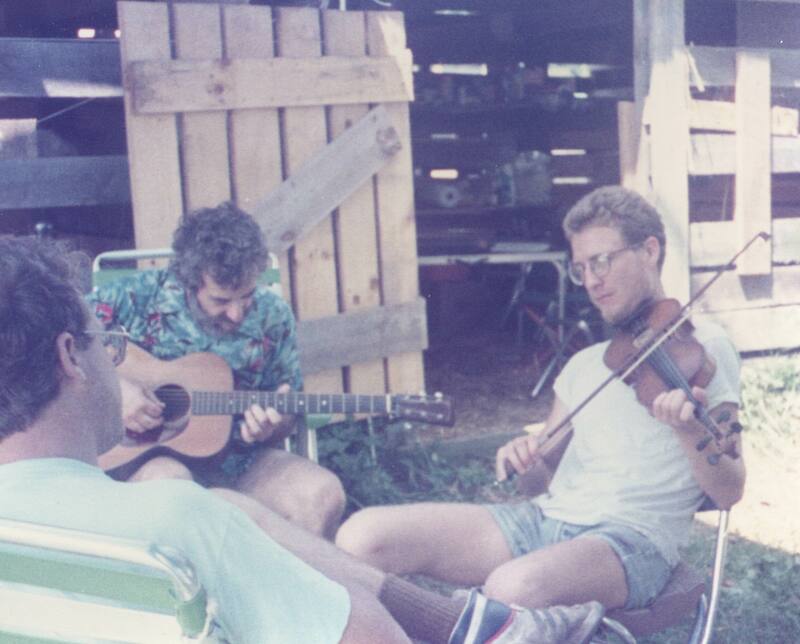 In the late 1980s, then-WFDD News Director Paul Brown created Across the Blue Ridge, a radio program that told some of America’s most fascinating stories through the lens of Appalachian music and cultural history. 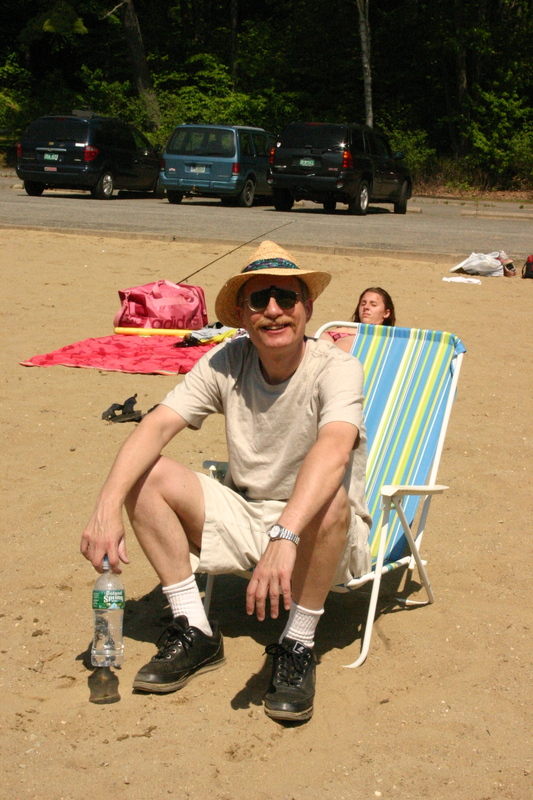 It became an instant hit and was broadcast on WFDD for more than a decade until Paul left WFDD for NPR in Washington, DC. With Paul back in his cherished Blue Ridge region, and ready to present more music, share discussion with more interesting characters, and be your friend and guide in discovering the rich offerings of traditional Appalachian music, we created a partnership with Paul to bring back the beloved Across the Blue Ridge radio show. Across the Blue Ridge focuses on the southern Blue Ridge area known through generations and still today as a hotbed of old-time, bluegrass, blues, and country music. And the program reaches far beyond, exploring southern music as the music most people around the world understand as distinctively American. Across the Blue Ridge is smart, irreverent, fun, serious, and entertaining all at once. How could it not be? 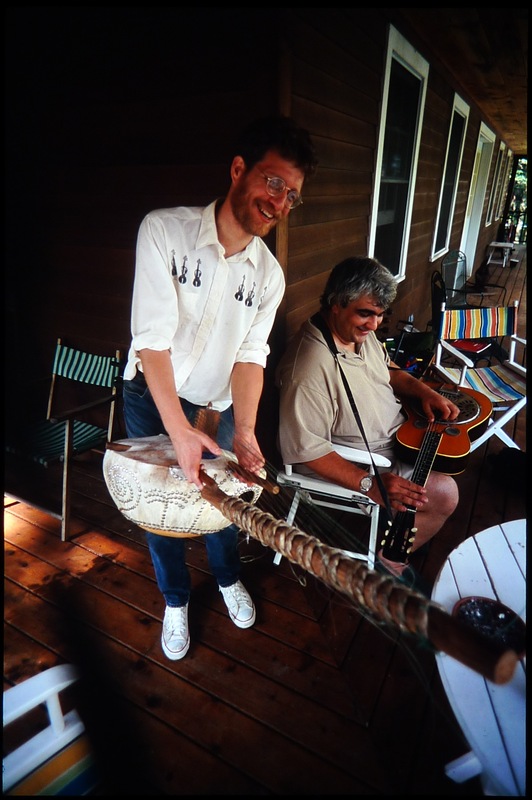 Its host, Paul Brown, is a well-known former NPR journalist and radio producer who also happens to be a prize-winning banjo picker, fiddle player singer and storyteller. The show is filled with those “a-ha” moments for which public radio is known – moments that help listeners make new connections regarding history, art, music, politics, and the past, present, and future. 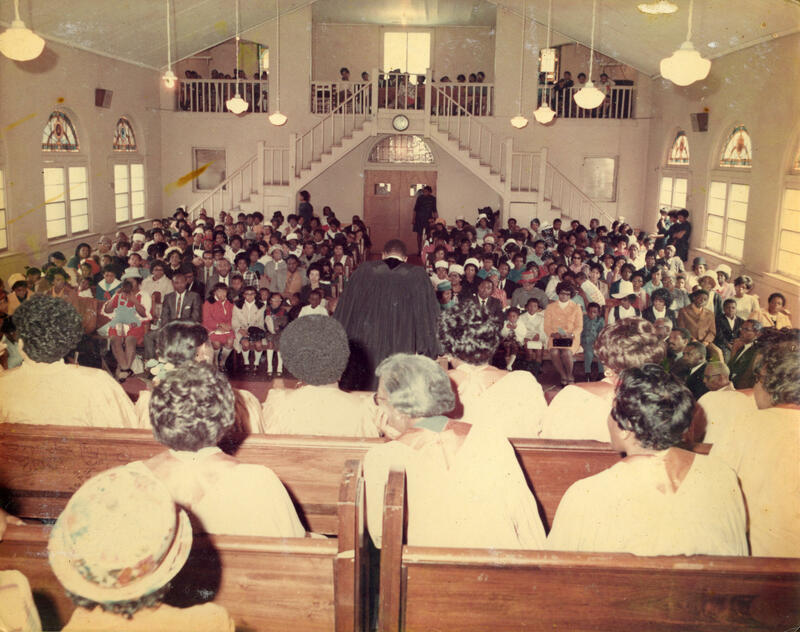 A long but interesting story about the Carter Family documentary…. While it’s a little hard to admit that every now and then I can lose my focus and get sidetracked, there are those occasions when I take on a particular subject only to end up somewhere else. 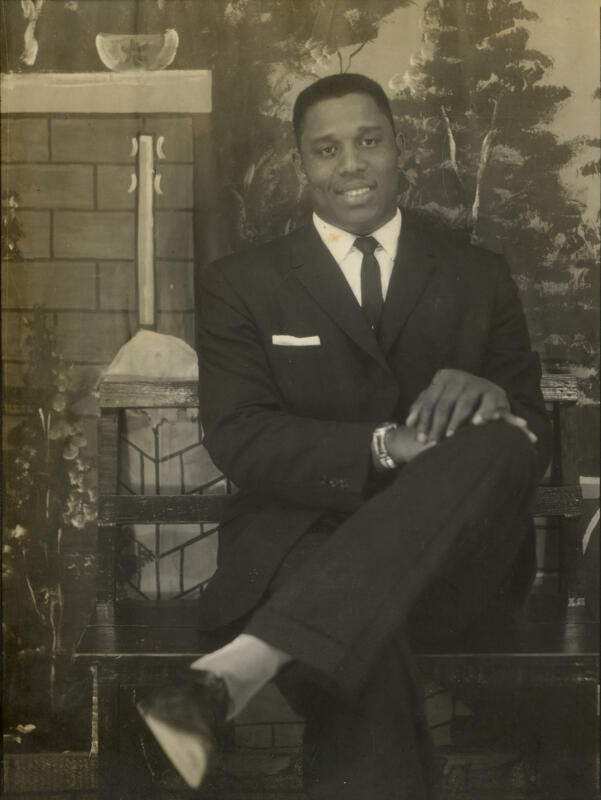 For example, about a month ago I sat down to write a short essay about the Carter Family, and by the time I got to the second paragraph I had shifted the focus to the African-American influence in roots music, featuring videos from Uncle John Scruggs to Grandmaster Flash. But after spending several months of researching and reading books about Sara, Maybelle and A.P. Carter, listening to hours of audio recordings and radio transcriptions, and watching an excellent documentary titled The Winding Stream you’d think I would be prepared this time around not to stray from the path. Wrong. As much as I’d love to retell the story of the Carter Family for those who may not know how they’ve left an everlasting imprint on American music, it is the journey of award-winning independent producer, director and writer Beth Harrington and the way she brought the Carter’s story to the screen that has currently captured my interest. It’s too good of a tale to not be told. And better still, most of it will be in her own words. God bless digital footprints. My name is Beth Harrington, and I’ve been a documentary filmmaker for more than 30 years. I’m also a former musician – a singer in the band Jonathan Richman & the Modern Lovers. So there you have it, my two loves – music and documentary film. 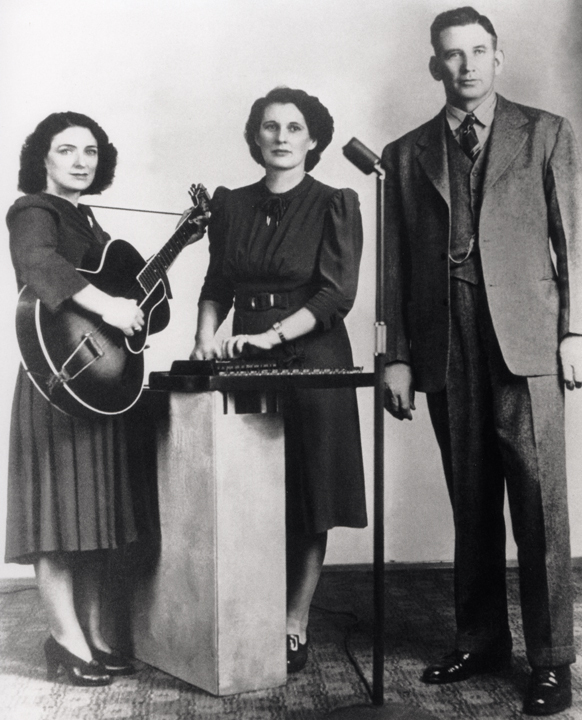 I’d been aware of the Original Carter Family – the biggest “old-timey” music act of their day – and their musical legacy for a long time. But working on Welcome to the Club and meeting Rosanne Cash (who narrated that film) made me think it was time to do a film about this music dynasty that stretched from the 1920s to the present. I wanted to explore how the Carters practically “invented” country music and how legions of musicians – from Woody Guthrie to Elvis to Johnny Cash to Joan Baez to Jeff Tweedy, to name a few – all feel a debt of gratitude to them. And, as a result, how the tradition instituted by the Original Carters has carried on in their family and in the culture at large. And I realized that, even though small parts of this family’s epic story had been told before, no one had presented this big picture. No one had shown the connection to the Carter Sisters, to Johnny Cash, to the folk movement and to the Americana movement. And no one had told the story using both original recordings AND contemporary roots music artists performing (and discussing) the music. I started shooting The Winding Stream in 2003 and, with Rosanne Cash’s help, one of the first interviews I did was with her dad, Johnny Cash. Sadly, it was to be one of his last interviews; he passed away only three weeks after we’d spoken with him. This forced the realization that I needed to step up production because we were losing some of the key players in this story. I felt a real urgency to get these interviews on tape. I spent a lot of my own money doing so. And I’m very glad I did. But I knew I would need more. What stuck out for me when I first read those words was the year that Beth noted she first started to shoot this film: 2003. Seven years later she was seeking money to complete editing, sound design, music and footage rights, animation, graphics and titles. That right there is the definition of vision, focus and tenacity. For those of you who’ve either started or contributed to a Kickstarter or any other crowdsourcing project, it’s a leap of faith that you’ll get to your goal. Sometimes there’s just not enough money donated to keep it going, and there are other times that the original idea turns out to be either flawed, abandoned or simply unable to be completed for any infinite number of reasons. But there was something I noticed about The Winding Stream campaign that was different than most, aside from the fact that the picture was actually completed and released: in five years Beth has published forty-two updates to her supporters. What follows is a look into what it took to get this film to the finish line. I’ll share a few of her updates with a little selective editing, and dispense with quotation marks since y’all know it’s Beth’s writing. Update #4, December 8 2010: Hi everyone. Well, as you may know by now, we’ve reached our Kickstarter goal! I’m moved and grateful to all of you who contributed to this campaign. And you did it in three weeks. Thank you so very much! Update #15, March 21, 2011: Just a quick note to let you all know that we’ve been putting the funds we raised with your help to very good use. Just back from Bristol, Tennessee/Virginia (yup, it’s a city in two states) and we got five critical interviews done, plus a musical performance with the Carolina Chocolate Drops. Wildly successful trip. Probably a Nashville shoot still in our future and one in California and we’ll be close to done shooting. Update #17, February 28, 2012: I realize it’s been a while since I’ve updated you on things connected to The Winding Stream so here’s a little update. We’re well into post-production now which means there is a glimmer at the end of the tunnel (not exactly a light yet, but soon). Since last I wrote we’ve received two grants – one from the National Endowment for the Arts and one from the Roy W. Dean Foundation which have helped us considerably and are big honors, needless to say. We’re in the running again for funding from the Independent Television Service and should know in a while if we get that. We’ve started to show excerpts from the film now – once at a fundraiser here in Washington State and more recently at the Big Sky Documentary Film Festival in Missoula, MT. Both times the reactions have been very positive which has buoyed our spirits a lot as we move along. Update #18, April 29, 2012: We’re writing to let you know about some new developments with The Winding Stream. We’re moving into full post-production soon with our pal, editor Greg Snider at the helm. And we’ve found a wonderful animator to do cool photo-animations for us, Mike Olson. I’m at work on the companion book to the film, and we’ve had interest from cable channels, film festivals and theatrical and DVD distributors for when the film is done. Our hope is to wrap it all up by the end of the year. May 3, 2012: A second round of Kickstarter funding begins. Update #25, June 21, 2012: In the last 9 years I have amassed a treasure trove of what I consider to be important interviews with people who were witness to some of our most important shared cultural history. The early days of radio, the infancy of the record industry, the growth of interest in what would later be called “country” and “folk” music. 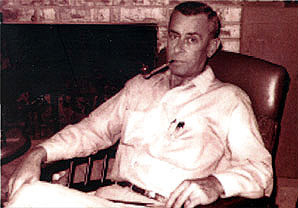 People like Johnny Cash, Janette and Joe Carter, Mike Seeger, Charles Wolfe and others knew the Original Carter Family and were among the last living witnesses to the Carters’ role in all this. The people I just named have all passed away in the time we’ve been working on this film. I started to view completion of this film as a sacred trust. These folks had taken the time to share this with me. This material couldn’t just languish on a shelf. It had to be made into the film I’d promised. So we stuck with it. Through years when everyone turned us down. Through times when we scraped by with tiny amounts of money that would get us one more interview. Through lots and lots of days of colleagues and friends — er, actually, that’s redundant; my colleagues on The Winding Stream are my steadfast friends –donating their time and talent and energy to this. Through many sleepless nights when I did think that I was – indeed – plum crazy to persist. 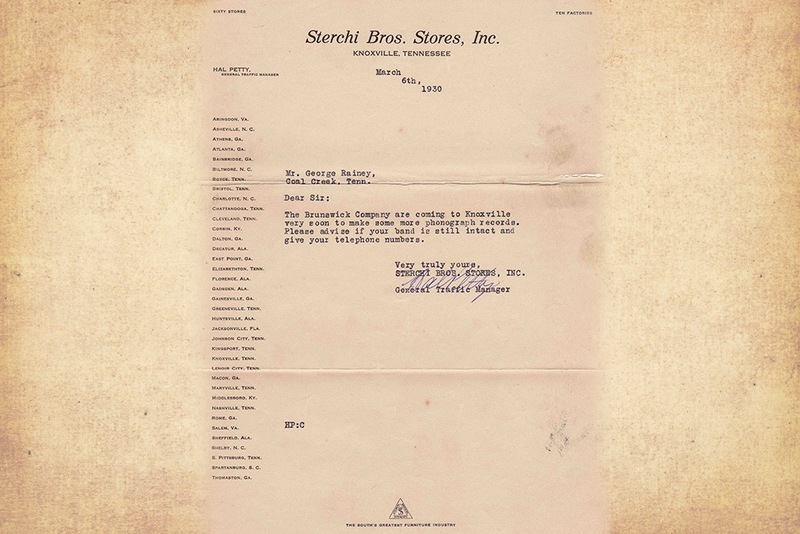 June 27, 2012: Funding for the second Kickstarter campaign is met. 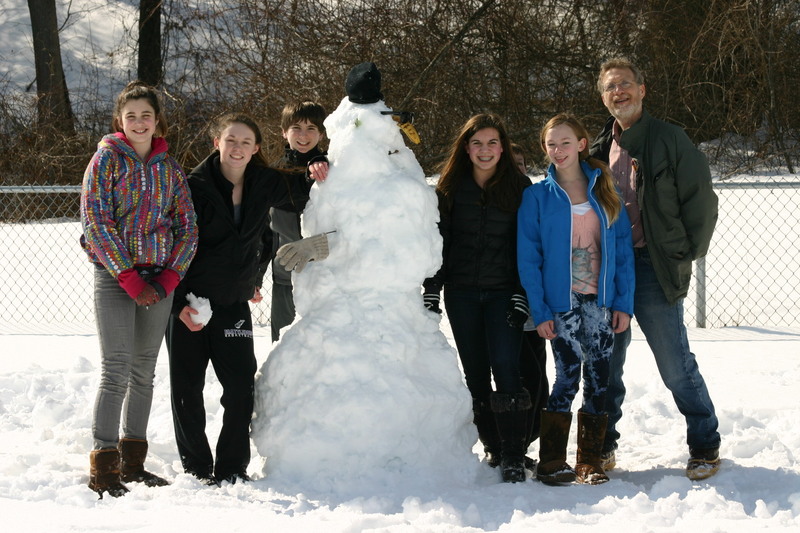 Update #28: January 7, 2013: Hi everybody! Wanted to let you all know how much progress we’ve made on The Winding Stream! We have a final cut of the film and are now clearing rights for the music and archival images. If all goes well, we should have a completed film very soon. Thanks again for helping us get this far! Update #29, February 1, 2014: Stopping by to let you know that great things are happening for The Winding Stream. We just recently learned that this labor of love- that’s taken more than a decade and the efforts of numerous talented people to complete – has been chosen for this year’s South by Southwest Festival in Austin. Update #33, August 7, 2014: Monday’s NYC premiere of The Winding Stream at Walter Reade Theater at Lincoln Center was a big hit. We had a full-house and the New York audience embraced the film. We’d also like to announce that The Winding Stream won the Audience Award for Best Documentary at the Woods Hole Film Festival. This is our fourth festival award and we’re very grateful to be recognized this way. Thanks to all of our Kickstarter backers! You helped make this possible. Updare #37, December 12, 2014: We have a big, exciting challenge! As you may know, we need to finish paying for music and archival footage and rights before we can open the film theatrically, air it on public television, or make it available on platforms like iTunes and cable on demand. 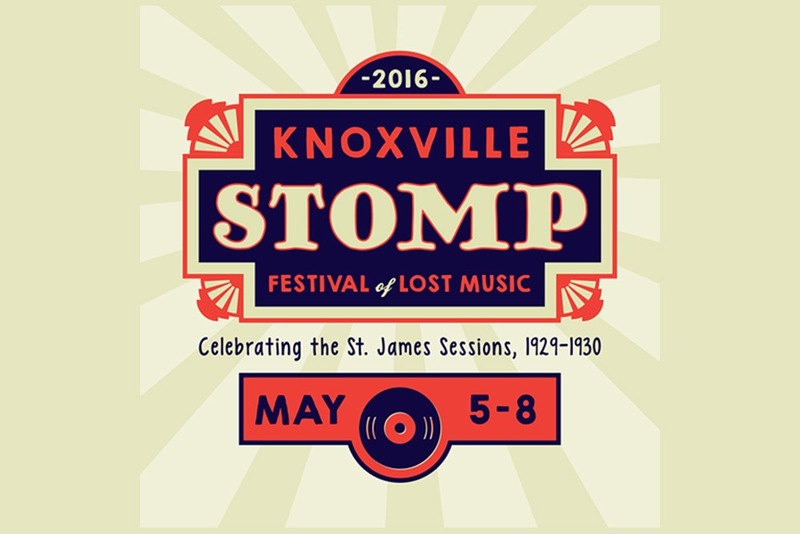 We want to make all this happen as soon as possible to build off our festival momentum. We once needed $85,000. But incredibly we have recently received a grant from the Marie Lamfrom Charitable Foundation for half that! Update #39, September 2, 2015: Hi Friends – I wanted to let you all know that we’ve entered the next phase of the life of The Winding Stream! Theatrical! Thanks to the efforts of our partners at Argot Pictures, we are now taking the film to art houses across the country. We are also thrilled to say that the good folks at Omnivore Recordings are releasing a soundtrack album from the film! That drops on October 16. Alright…so as you can tell, I’ve been completely swept away by Beth, her team and this unbelievably enchanting film. On a musical highway that’s ninety years long and still stretches out before us, there are unlimited on and off ramps that this filmmaker could have chosen. With a subtitle that reads ‘The Carters, The Cashes and The Course of Country Music’, she brings to life a family tree with endless branches. By using the voices of those still living and the ones who’ve passed on, and enhancing that experience with film, video, photographs and animation, the music and stories are presented with the delicacy and historical context one could have only hoped for. There is a tendency to receive and process information in bite-sized pieces in this technologically supercharged world we live in. And I’m sure Beth would agree that it would be a mistake to believe that the tales of this great musical family can be told in a mere ninety-two minutes, despite over a decade in the making. (I’d love to see what didn’t make the final cut.) I think of The Winding Stream as a doorway to discovery, and hope that people will be inspired to seek out not only the music which has endured over the years and is readily available, but also take the time to learn more about the folks who absolutely define any such notion of what you might think the term Americana means. This is a story for the ages. 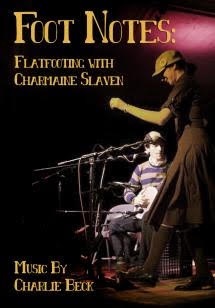 For those of you in the New York area, I plan to attend a screening at the Jacob Burns Film Center in Pleasantville (the most appropriately named town ever) on February 11, and there’ll be some fine live music from the Shovel Ready String Band. Buy your tickets before they sell out and if you happen to see me, please say hi. The below link offers sound samples from all over West Africa. Posted on November 20th, 2015 in Recent posts by Songlines Magazine. West Africa: Word, Symbol, Song showcases music and literature from the great African empires of the Middle Ages to the cultural dynamism of West Africa today. It aims to demonstrate how West Africans have harnessed the power of words to build societies, sustain religious belief, drive political movements, fight injustice and express creative ideas. Recordings show living traditions, including epic narratives right through to West African rap. The tracks here loosely follow the exhibition’s storyline to highlight historic and unique unpublished recordings in the Library’s collections. 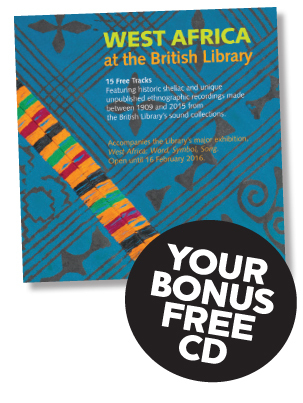 West Africa at the British Library is a free covermount CD exclusively available with the December 2015 (#113) edition of Songlines. 3) Knew any of Max’s “informants” or was in touch with anyone who did. I’d particularly welcome further information on Kris Ann Parker (of Springfield), Arkansas singer Stephanie Isaacs who performed at Eureka Springs as a child, in addition to anyone else listed as contributors. 4) I’d also welcome stories of the Eureka Springs Festival back in the day when Max was MC’ng, or similarly, of Silver Dollar City. My life has basically been an obsession with old-time music for a decade and a half. I learned at the feet of master musicians, listened to tens of thousands of recordings, decoded the bow strokes and mysterious intervals of legendary fiddlers and I woodshedded for years. I still do. Eventually I began teaching old-time music, out of the sheer love of the music itself and the desire to pass down what I’ve learned to others. Apparently, I have a knack for teaching the elusive art of bowing so I spend everyday of the week teaching just that. Throughout this obsessive time period I’ve wondered what it would be like if we had extensive footage of many of my favorite dead musicians. To see, up close, hours of playing from Fred Cockerham, Marcus Martin, Joseph Spence, John Lusk, etc. would be astounding. To see their body language, the nuances of hand movement and even their faces while performing can give great insight to the curious musician and student of old-time. As a player and teacher, I’m very interested in the physical dimension of music. So I started thinking about my favorite musicians of today. Even in the digital smartphone age, there is a serious dearth of beautiful, archival quality footage of today’s living masters. 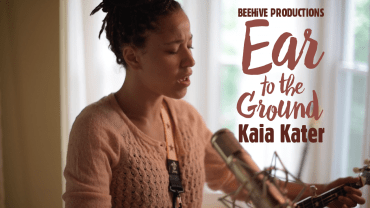 Even today’s touring musicians quite often have only shaky smartphone footage on YouTube and maybe a couple well-produced music videos shot in Europe that were essentially performed to a pre-recorded track. In a past life I was a filmmaker and amateur folklorist recording the folktales and music of itinerant street magicians in India, the last vestige of medicine show performance. Naturally I decided to bring the documentation of folk art back into the fold and start recording the best of the best in old-time. By establishing the Old-Time Tiki Parlour, I set forth on this very path. I’ve assembled a team of artists, graphic designers and producers for my team. One requirement: the team must all be old-time musicians. That way, everything from close-up angles to the liner notes are all presented, recorded and composed by musicians that know the music inside and out. 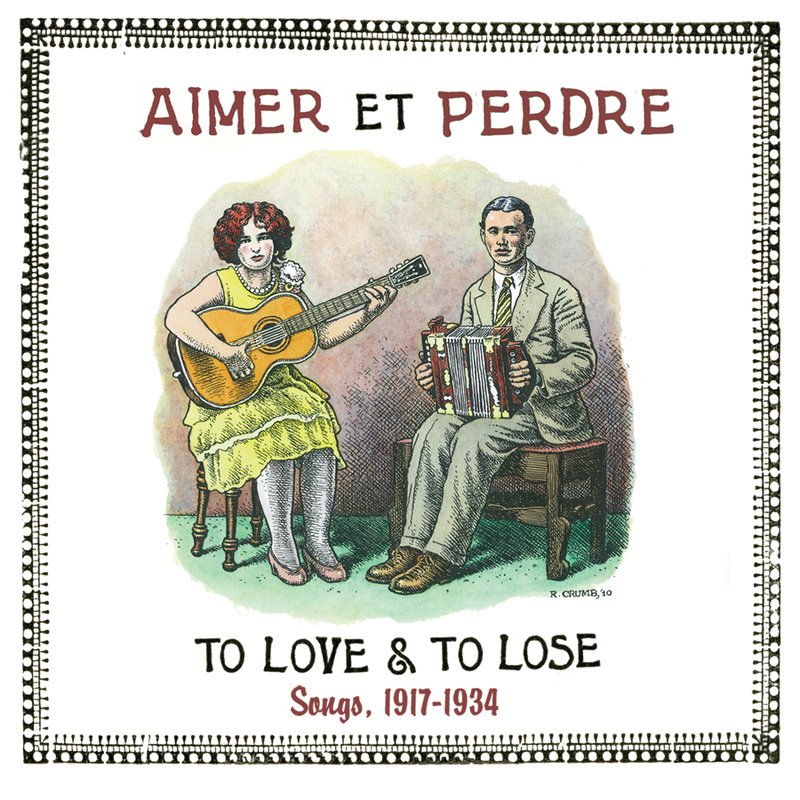 In the last couple years, I’ve produced and recorded twelve old-time music releases on CD and DVD. So far, Dan Gellert, Rafe & Clelia Stefanini, Eric & Suzy Thompson and my solo fiddle CD “Big Fancy” are available. All releases feature music, first and foremost. These are not documentaries or hipster music videos. These releases showcase great musicians, in a room alone, doing what they do best. No fancy effects or studio tricks permitted. I’m currently editing footage and recording more musicians. I recently put together a video that highlights some of the musicians I’ve shot to give you a glimpse into the past, present and future of Tiki Parlour Recordings. Enjoy! Between 1999 and 2000, producer Hal Willner and Meltdown Festival artist-in-residence Nick Cave staged a series of epic five-hour-plus concerts in London, New York, and Los Angeles, intending to celebrate Smith’s work as an experimental filmmaker and musicologist by pairing contemporary artists with bits of Smith’s films and The Anthology‘s ancient folksongs: Beck, Beth Orton, Phillip Glass, Van Dyke Parks, Elvis Costello, Wilco, Steve Earle, Lou Reed, Marianne Faithfull, and a mess of other artists agreed to participate. The Harry Smith Project documents the concerts, pairing two CDs of live cuts with a DVD of concert footage (some featuring the legendary camera-stylings of D.A. Pennebaker and his team) and The Old, Weird America, a documentary about the global endeavor. Working musicians cover The Anthology‘s songs all the time, and The Harry Smith Projectisn’t the first time modern stabs have been documented in deference– Smithsonian Folkways released The Harry Smith Connection in 1997, the soundtrack to a pair of tribute concerts held in Vienna, Virginia to celebrate The Anthology‘s CD reissue (featuring tracks by Dave Van Ronk, Jeff Tweedy, The New Lost City Ramblers, and others.) 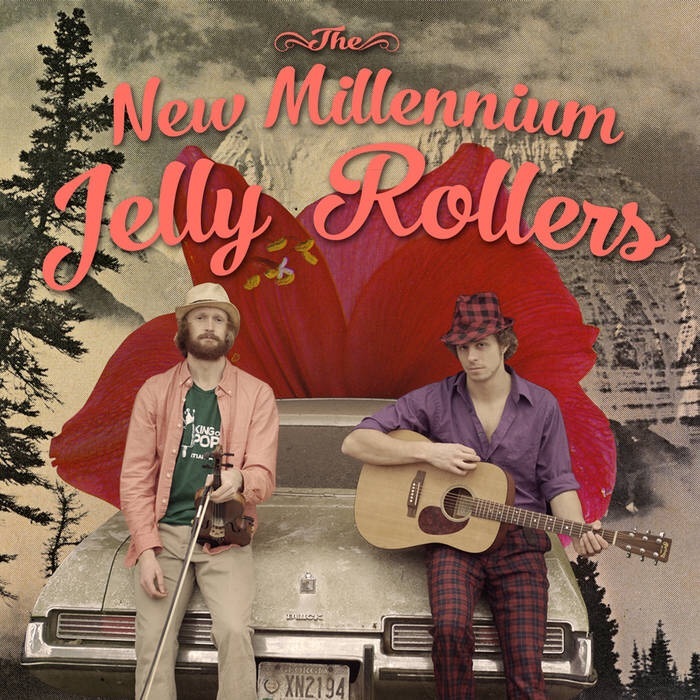 Still, many of these songs are so specific to their time and place– Beale Street, dusty Delta crossroads, southern chain gangs, Appalachian cabins, Tennessee coal mines– that a contemporary re-creation, no matter how well-intentioned or well-rendered, still feels a little ridiculous, like stomping through Colonial Williamsburg eating a hot dog and wearing a baseball cap. 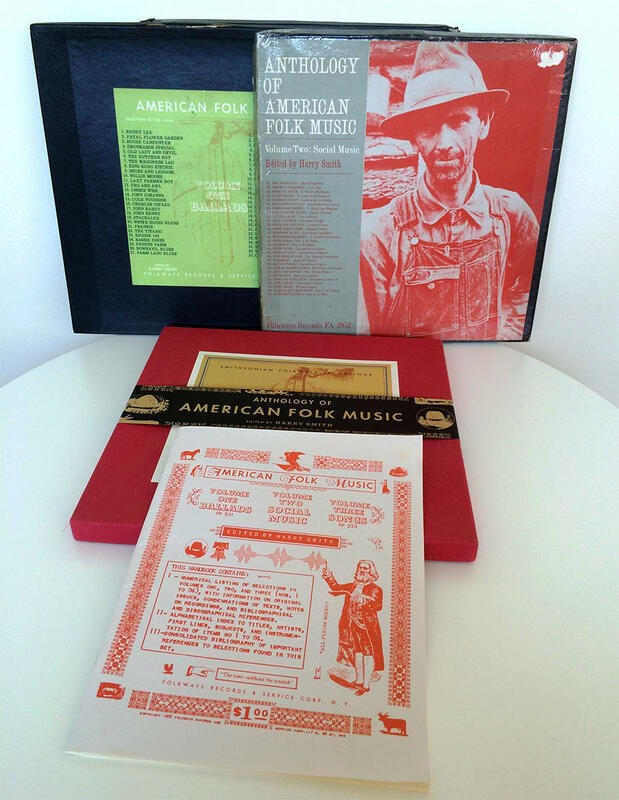 And while plenty of the cuts on The Anthology were “covers” to begin with (most early country and folksongs were re-workings of traditional gospel songs), they were captured at a time when folk music functioned a little bit differently– when it was a vital and necessary method of documenting and lamenting the daily struggles of the poor, and not yet a political tool or floppy, coffeehouse luxury. Consequently, The Harry Smith Project works best as homage: These songs are buried treasure, beloved not only for their melody and performance, but for what they indicate about an America long obliterated. It’s always nice to hear them honored (and to appreciate their songcraft without being distracted by rudimentary production techniques), but plenty is lost in translation. Howling the Carter Family hit “Single Girl, Married Girl”, Petra Haden never quite captures Sara Carter’s strained desperation (Sara’s husband, Carter patriarch A.P., was notoriously absent; Sara later left him for his cousin, quit the band, and moved to California), sounding weirdly jubilant instead. Wilco’s take on Richard Rabbit Brown’s “James Alley Blues” is rich and convincing, with Jeff Tweedy grumbling on point, all sad-faced and earnest: “Towns right now ain’t nothing like they used to be/ I’ll tell you all the truth/ Won’t you take my word from me/ I seen better days and I ain’t putting up with these.” Beck’s version of Robert Johnson’s “Last Fair Deal Gone Down” features loads of sloppy slide and haphazard, soulful yelps, while the box’s highlight is traditional cut “Sail Away Lady”, performed by Uncle Bunt Stephens on the original Anthology, and rendered beautifully here by Van Dyke Parks and the Mondrian String Quartet. 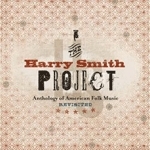 The Harry Smith Project inadvertently asks big questions about the state of contemporary blues and folk, and works as an honest, loving tribute to the songs that informed the musical sensibilities of countless performers– and, hopefully, will lead its listeners straight back to the big, red box every American music fan should own. I have stories to tell about Jonathan Bekoff. 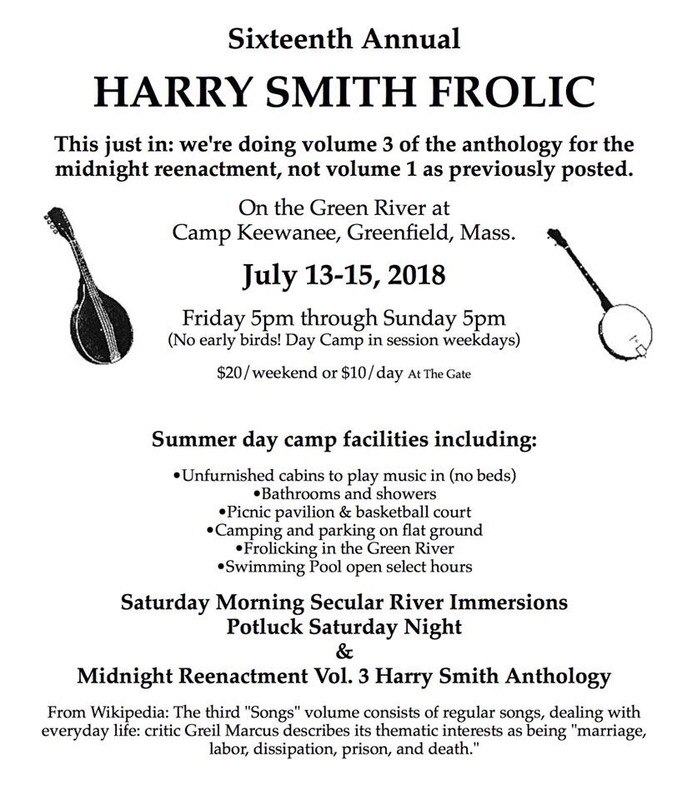 On the Green River at Camp Keewanee, Greenfield, Mass. 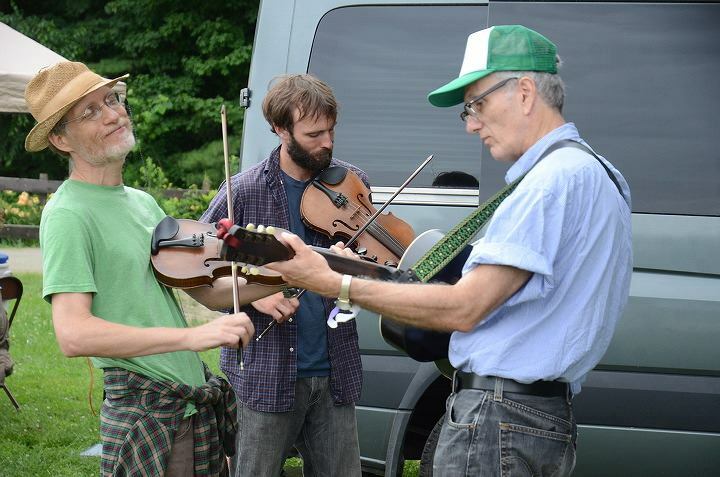 Fiddling Nate Paine and his father and brother. Nate was a protege of Jon Bekoff, RIP, former curator of this blog.